ACD Direct is a Contact Center Solution Company handling call center needs for familiar organizations. The business began 14 years ago in Utah – getting their start offering customer support services to a very large computer manufacturer. ACD has since evolved from being a brick and mortar call center to now offering virtual call center services. ACD works mainly with non-profit organizations like NPR, PBS and other organizations like political campaigns and charities. 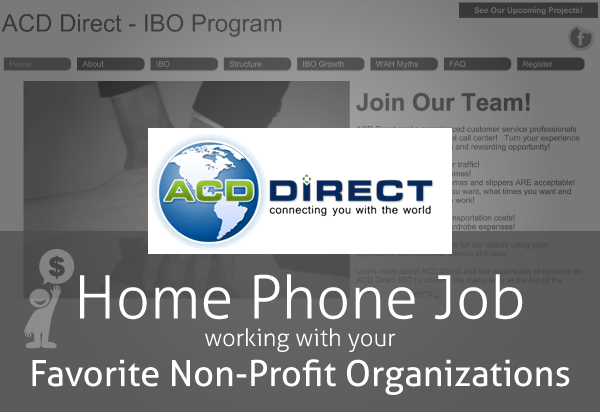 What is an ACD Direct IBO? ACD Direct uses the term IBO often. The acronym stands for Independent Business Owner. It is very clear that when working for ACD Direct- you are working for yourself as an independent contractor. IBOs working for ACD Direct answer inbound calls and follow a flexible script to assist the clients needs at the time. Most commonly, the calls received by IBOs are from generous people interested in donating to their favorite charity, a local PBS channel or radio station. ACD agents collect information from the caller to fulfill the needs of the client. In addition to collecting data, agents are also available to provide help by answering questions from callers. ACD Direct offers one of the more flexible scheduling systems than most other work at home call centers. The schedule is released weekly at an announced time and date. Agents are able to choose their own schedule – generally in increments of half hour commitments. The virtual call center is open 24/7. Agents are paid per talk minute – meaning to make the most per hour- you will want to work during the highest call volume. In order to help you reach your goals, the schedule has a color coding system that will allow you to be aware of the expected peak times. Agents agree to work a minimum of 10 commitments (generally 5 hours) a month in order to maintain their relationship with ACD. Call Volume with ACD not only varies on a daily basis but also seasonally. There are known peak seasons when campaigns are in full force and months when there is not as much going on. Even when call volume is low- you will be expected to meet your minimum 10 commitments per month. ACD is best for those who have other options for making money when things are slow. For example- a lot of LiveOps agents pair up with ACD as both are flexible and many people find the slow LiveOps season matches the peak seasons of ACD. ACD works only with established business owners. You will need to be incorporated or have a DBA registration with an EIN number. The latter is a lot less complicated and affordable. Check with your Secretary of State’s office if you need to know more about registering your business. If you do not have a registered business- ACD will often give you up to 90 days to register. Must be able to complete the entire certification process within 14 days of notification of acceptance. Additionally, there are minimum computer requirements. You can view the most up-to-date requirements on the ACD website. ACD pays their agents for talk time on the phone at a base rate of 20 cents per minute. The per minute rate can increase to as much as 32 center per minute during peak call times. Thankfully there is room for advancement. After an agent completes 500 minutes of talk time- they will be offered incentives to potentially increase their rate. 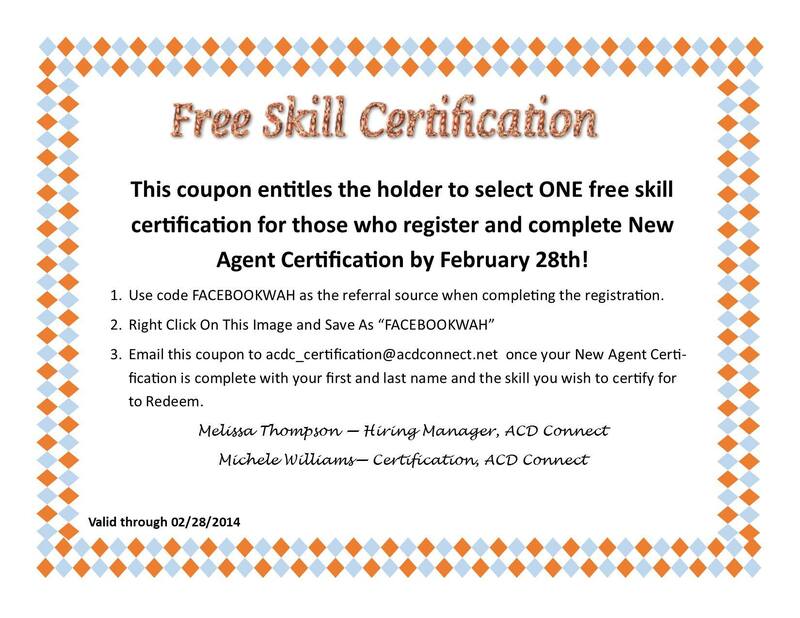 In addition to the incentives offered to experienced agents- there are advancement opportunities at ACD. It seems this company prefers to hire from within. See their site for a list of typical advancement opportunities. ACD pays via Direct Deposit twice a month. Funds are generally received within a week of the 15th and the last day of the month. Aside from the typical expenses of running and maintaining your own virtual call center from your home (phone, headset, internet, antivirus software etc), there are costs involved with working for ACD Direct. After an agent is invited to certify for ACD- they will need to pass a criminal background check and complete certification. The fee for both the background check and initial certification is $45. This is a very typical fee to expect when working as an independent contractor for a virtual call center. The first step toward becoming an IBO for ACD Direct is filling out the online registration. Once the registration is filled in- an automatic email will be sent to you with direction for how to complete a vocal demonstration. The voice sample is collected to ensure you can speak with a professional tone in a clear and understandable manner. ACD will review your registration and if they feel you could possess the skills needed to succeed – will contact you when positions become available. Because ACDs call volume needs vary- they make an effort to avoid over-hiring. ACD responds via email. You will then be given a contract to review and sign as well as material to begin certification for clients. Then, you will have a test call to complete prior to being released to begin. Keep in mind, there will be a time limit for each step through the certification process- ACD will communicate the timeline to you prior to you beginning. Overall- agents are expected to be ready to begin taking calls within 14 days of being invited to certify. Best wishes to anyone who chooses to pursue working for ACD Direct. Great post, Miranda. I actually worked for ACD Direct for about a year. They are a nice company with nice clients, but it is very difficult to make money during a non-campaign month. TeaJae, did they go back to their old requirements? I worked for ACD Direct for 3 years and I loved it. I completely agree with TeaJae’s review, a good place to start but not a main job. The calls were eat, the callers were almost always friendly and most were basic data entry calls. Upskills were inexpensive and helped you achieve more opportunities to receive more calls. I left when they requested agents to have weekly minimums instead if monthly. It appears they have gone back to the old schedule, which is good if you are looking for a little extra cash to add to your account. The holiday campaigns keep the calls and the cash coming in and adding up skills/clients keep you earning at least a little something. I really loved everyone I worked with and enjoyed my time there.